Astrophysicists want to present a groundbreaking discovery on Wednesday afternoon with the Event Horizon Telescope. There are things in the universe that are very difficult to grasp with the human mind. That is why John Archibald Wheeler coined the term “black hole” at a meeting of experts, but this phenomenon has not yet been seen, there are only computer simulations and now for the first time: Experts expect the first recording on Wednesday afternoon (3 pm) The team from the event Horizon telescope network wants to announce a “groundbreaking result” at six press conferences around the world, and the network is set to make the world’s first direct onset of the phenomenon. So far, the existence of black holes could be detected only by detours. What it actually is? Black holes are places of extremes. They are in the center of almost every galaxy. When enough matter is compacted in the smallest of spaces, enormous gravitational forces are created that absorb everything in the universe: matter particles as well as light. 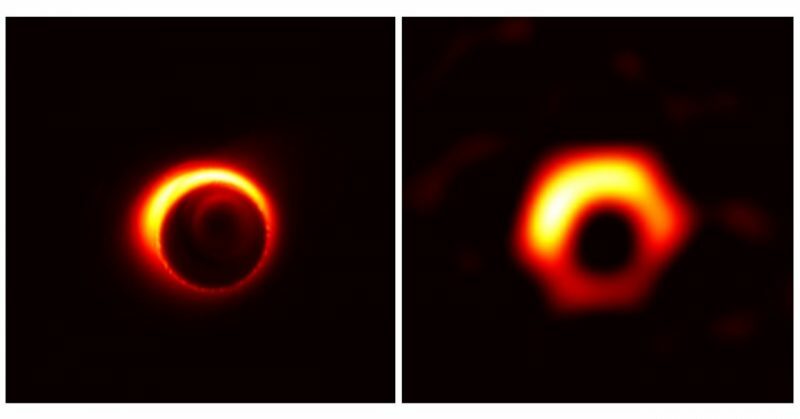 It is “swallowed” in it, which is why it is so difficult to depict the resulting black hole. However, the holes betray themselves over the matter they absorb. It becomes extremely hot and then shines brightly. This characteristic glow can be seen by telescopes. Two years ago, Event Horizon astronomers focused their telescope network on two black holes, one at the center of the Milky Way. Since then they have evaluated the data. The announcement suggests that we actually shot a photo. Albert Einstein would be astonished, his theory of relativity predicted such objects. He has never seen a black hole. Scientists have been shaking their heads since the 18th century about these phenomena. The naturalist John Mitchell called them “dark stars” in 1783. Then mathematicians set to work to describe the objects in more detail: Stephen Hawking was among the researchers, and he recognized on the basis of quantum theoretical considerations that black holes also emit radiation. The one black hole (Sagittarius A) is located approximately 26,500 light-years from Earth and has a mass of 4.1 million solar masses. The second “model” is Messier 87 and lies in the constellation of the Virgin, which is 55 million light-years away.